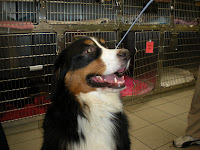 On a Friday morning Bailey a four year old Bernese mountain dog (one of my favorite breeds) presented to me on emergency after collapsing on his morning walk. His owners report he had been lethargic the night before and didn’t want to eat dinner. While on the walk he became weak and collapsed, after resting for a few minutes he tried to get up again but collapsed a few yards later. His physical exam was fairly unremarkable with the exception of an extremely elevated heart rate. I was initially concerned the weakness was from anemia due to a bleeding tumor in his spleen or an immune-mediated disease that was attacking his read blood cells. We admitted Bailey for supportive care and initial diagnostics. Radiographs of his chest and abdomen were taken immediately and did not show any abnormalities. Now I just had to wait for the blood work which I would have back in an hour and monitor his clinical signs. Bailey’s owners called when they arrived home to let us know that he had chewed up an albuterol asthma inhaler and could this be the cause? I called ASPCA poison control to speak with a veterinary toxicologist and confirm that all of his clinical signs could be explained by albuterol toxicity. This medication is used in asthmatic people and animals to dilate airways making it easier to breath. Signs of toxicity include increased heart rate, electrolyte abnormalities, high blood pressure, fever, vomiting and hyper-excitability. We had to administer a medication to help slow down Bailey’s heart but since his heart had been beating so fast for almost 24 hours if we gave the medication too fast he could go into cardiac arrest and die. We carefully gave the medication and monitored his heart rate constantly, happily everything went as planned. Overnight he was kept on intravenous fluids to correct the electrolyte abnormalities that had occurred and his heart rate was monitored every hour. By the next morning he was eating again and ready to go home. Bailey’s story is important in that at Friendship we often see cats and dogs get into medications, prescribed to them or their owners. Bailey was lucky in that his owners knew what he got into so we were able to treat quickly and aggressively, often this is not the case. Be sure to keep all medications closed in a drawer or cabinet. If your pet does get into something either call ASPCA Poison Control or bring them in on emergency immediately.